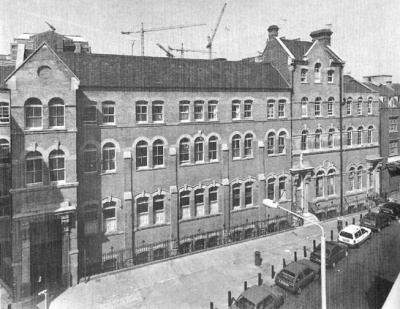 The Providence (Row) Night Refuge was founded in 1860, and heavily supported by Alfred Purssell, and his children, and sons-in-law almost from its foundation. In 1909, Edmund Bellord (Agnes Purssell’s husband) was chairing the committee. The family attendees on Christmas Day, included most of the Bellord family, Agnes Bellord’s nephew, and nieces from the Winstanley family. Rex and Florence O’Bryen, who are also there, are Agnes Bellord’s sister’s [ Gertrude O’Bryen (nee Purssell)’s] brother-in-law, and his wife. J.W. (John) Gilbert the Hon. Secretary was the nephew of Mgr. Gilbert, the founder. Wilfrid Parker, Alfred Purssell’s son in law, was chairman of the committee in 1931, Wilfrid’s nephew George Bellord was also on the committee that year. George’s father, Edmund Bellord (Agnes Purssell’s husband) had also chaired the committee. Frank Purssell had also been on the committee, and deputised for his father at times. On Christmas Day at the Providence (Row) Night Refuge, Crispin-street, E., in accordance with the custom of the Founder, the late Mgr. Gilbert, a special Christmas dinner, consisting of hot soup, beef, potatoes, plum-pudding, bread, and oranges by way of dessert, was given to all the inmates of the Refuge. More than one hundred poor people, for whom there was no room in the Refuge, were admitted to the dinner, the total number of guests, men, women and children, being nearly 400. The two large refectories were gaily decorated for the occasion with holly and evergreen and Christmas mottoes. Mr. E. J. Bellord (Chairman of the Committee) presided, and was supported by Mrs. E. J. Bellord, Mr. W. H. Foreman, Mr. and Mrs. R. O’Bryen, Mr. and Mrs. J. G. Bellord, Mr. L. J. Winstanley, Mr. E. A. McKenzie, Mr. A. Bellord, Mr. C. Bellord, Mr. E. Kerwin, the Misses Winstanley, Mr. G. McCarthy-Barry, Mr. A. McDonnell, Mr. J. McDonnell, Mr. J. Fentiman, the Misses Bellord, Miss Gilbert, Miss McCarthy-Barry, Miss Robinson, Mr. J. W. Gilbert (Secretary), and many others. In the men’s refectory before dinner, Mr. E. J. Bellord, on behalf of the Committee of the Refuge wished all the inmates a very happy Christmas. He greatly regretted that, owing to the abnormal amount of distress, there was so much poverty and suffering. He hoped, however that, with the New Year, there would be a better chance for them to secure work. They must, however, forget their troubles on this great day and enjoy the fare which was awaiting them. He would ask them to bear in memory the name of Dr. Gilbert, the Founder of the Refuge, who had left it in so good a condition that they were able to continue his work up to the present time, and to whom, therefore, they really owed their good dinner that day: He also wanted them always to remember how much they were indebted to the Sisters of Mercy, who devoted their lives to the service of the poor, and who, by their generous help, made the Refuge the useful institution it was. Dinner was served by the Sisters and the visitors, who were most generous in their attentions to their poor guests. For more than an hour both refectories presented a busy spectacle. After dinner each man was presented with a packet of tobacco and a cigar, which had been sent for them by two anonymous donors ; each woman received a small packet of tea and each child a toy, both of which were again the gifts of friends of the charity. Later on in the afternoon tea with cake was provided for the inmates, and a concert and entertainment were provided in each section for them. The above text was found on p.38, 2nd January 1909 in “The Tablet: The International Catholic News Weekly.” Reproduced with kind permission of the Publisher. The Tablet can be found at http://www.thetablet.co.uk . Previous post1896- Ireland, 2 Gold medals, 2016- Ireland, 2 silver medals…….